As believers we sing it with such enthusiasm. Amazing Grace is a widely known song which has captured the heart of every believer, and is sung among everyone who feels deeply indebted to God for showing such great love for them. Those who have come to know their wretched state; I can never repay him. Hence, the song denotes the essence of the transformation and hope found in Him. In my studies I get to talk about God often; my own experience and life becoming an honor to serve him, a great example of how God’s mercy changes us for the better. 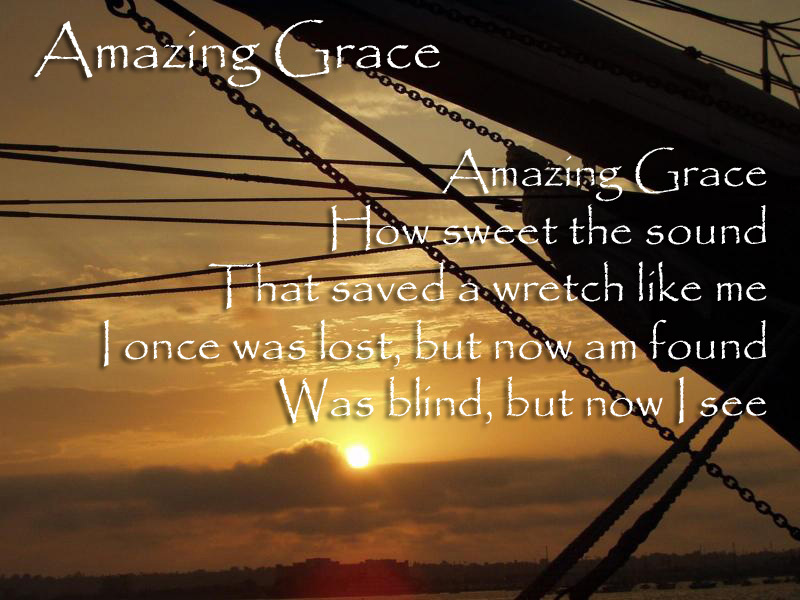 So when we were asked to analyze a poem for this week’s assignment I was so glad that once again I get to talk about God and chose the poem “Amazing Grace.” Many know it as a song and as I write I can hear that awesome, familiar tune so clearly. It should be an easy assignment one would think so, but as with all my work I have to search out and seek to research its origin. I found out that it is written by a man who once kidnapped slaves, a man who was captain of the ship which brought them to America. What was going through his mind? I ask myself, because people just don’t come out of nowhere with this evil; they get it from somewhere. It is not the case that greed is inherited, but only that the thought took root in his heart before the actual event of doing it. Anger swells in me as I imagine him and other men silently entering villages where men, women live going about the routine of life, and where their children play. I envision a babe suckling at his mother’s breast only to be snatched away from the only love he has known since birth, and I feel strong vengeance against them as they stalk husbands while they hunt their family’s meal amidst the forest trees. What were they thinking as they shackled and chained another human being whose heart beat just like their own? How could they place them bare, naked amongst a crowd of people looking into their mouths like animals; not that they cared to know for their good, but so that they could get top dollar price when they were sold to the highest bid? I wonder how in the world one forgives them and all the hurt they caused. Our people don’t even know who their true relatives are. How do you forgive such horror? How? But God shows no partiality, he has grace and mercy for the just as well as the unjust, and he will answer anyone no matter what they’ve done when they call. He truly is amazing…pray for me as I write this work, because I write this in sorrow. Not sorrow for me only, but for all of us who are still enslaved in our minds four hundred years later. The knowledge that the writer of the poem “Amazing Grace” was one of them has stirred me to tears. I have sung this song to audiences in church all my life and never knew its origin, and I am moved even more to hear the message it brings with it. Why? Because I know what it is first hand to be forgiven by God being that he is not a respecter of persons; he says to “love our neighbors as ourselves …”If you really fulfill the royal law according to the Scripture, “You shall love your neighbor as yourself,” you are doing well.” (James 2:8, ESV). This being a reality I must forgive them as God has forgiven me, because the grace of God is given freely to the unjust as well as the just; God forgives everyone who asks. In this case even though the crime was one of the most terroristic, and heinous acts against other human beings to take place in American history it is over. God has forgiven, and John Newton experienced the mercy and forgiveness of the God of the Universe. The storm that saved his life was God plans to free a people. The theme of the poem in its essence says that God’s grace is amazing that all who call for help can be set free from their sins; no matter whether the sins are apparent God will come save them. It takes a personal experience with God, a one on one encounter to get our attention. The storm is that attention getter for John and he writes, “Amazing Grace, how sweet the sound that saved a wretch like me!” (Newton, J., 1725–1807, Lines 1,2). Since it is known that the human hearing cannot perceive grace; we can account that this amazing grace is of a spiritual nature; a metaphor to that grace. The scripture gives an account of this in saying, “But as it is written, Eye hath not seen, nor ear heard, neither have entered into the heart of man, the things which God hath prepared for them that love him.” (1 Corinthians 2:9). Byrd says, “exactly what-or who- convinced this slave trader that his occupation was evil enterprise? While Newton never clearly explained the details of the change, Phipps credits the influence of Newton’s friend who labored on the Methodist edge of Anglicanism, though Methodists disagreed over the morality of slavery with John Wesley who opposed slavery while John Whitfield owned slaves.” (Byrd., 2002, pp. 903, Para. 1). In the eyes the Most High God no sin is greater than the other, and even if one’s mind may fight against the truth of how anyone can be ignorant that taking another human against their will is wrong; still there is that unanswered question of how? Newton says, “Twas grace that taught my heart to fear, and grace my fears relieved; how precious that grace appeared the hour I first believed!” (Clugston, R. W., 2010, Lines 5-8, Sec. 9.3). The use of an aphorism depicts the thought that before belief one has no fear of a Power Greater than, but after confirmation of existence of God there is an awakening knowledge of sin; in other words ones sin is shown up by God. Thus, fear awakened reveals that God exists in turn leads one to fear God which ultimately leads to repentance. God teaches the truth of our sin which steers us in the other direction; true repentance turns away from sin, and God forgives when we ask him. In a sense for Newton this amazing grace was a set up before he knew that it even existed. Seemingly, another storm of life took him by surprise; thus what we see denotes a time when he too was kidnapped and forced to work on a warship; the implanted seed of sin. “In 1744 he was kidnapped and pressed into service in the British Royal Navy and was forced onto a man-o-war ship” (Newton, J., 1725-1807, Para. 4). Hence, Newton is no stranger to the storms he so adamantly proclaims deliverance from. He says, “Through many dangers, toils, and snares I have already come; ‘Tis grace that brought me safe thus far, and grace will lead me home.” (Clugston, R. W., 2010, Lines 9-12, Sec. 9.3). In conclusion, it is God’s grace not man’s which determines where one end up in life. The story of Newton’s life ended with him having a newness of life, forgiveness from God, and a spirit of compassion for his fellow man. God forgives those who ask him, those who have a change mind to ask. He hears from heaven and answers them when they call. Posted on September 14, 2012, in Life, spiritual, Uncategorized and tagged Amazing Grace, Bridgepoint Education, GOD, Grace, John Newton, John Wesley, Newton, San Diego. Bookmark the permalink. Leave a comment.